Informal volunteers who take action directly, unmediated by any formal organization, make up the global majority of volunteers, according to the State of the World’s Volunteerism Report 2018. In Asia and the Pacific region, there are nearly 29 million full-time equivalent volunteers. On International Volunteer Day, we celebrate the contributions made by volunteers to building resilient communities across Asia and the Pacific. Silvia Illescas (right) is an international UN Volunteer from Nicaragua, serving as Health Advocacy and Coordination Officer with WHO in Lao PDR. In Asia and the Pacific, there are nearly 29 million full-time equivalent volunteers. Volunteers are answering the call to serve their communities, strengthening local ownership and building their communities resilience against natural disasters, economic stresses and political shocks. This year, IVD celebrates volunteer efforts that strengthen local ownership and the resilience of the community in the face of natural disasters, economic stresses and political shocks. 5 December - International Volunteer Day this year focuses on how volunteers can build resilient communities. For the first time in Thailand, the United Nations Volunteers programme together with Thai Government, UNESCAP and local organizations held an event to recognize the contribution of volunteers in Thailand and to build public awareness of the IVD. The celebrations started with the launch of the State of the World’s Volunteerism Report (SWVR) 2018 in the morning. The afternoon was filled a workshop under the theme Volunteering and the SDGs, in which there were over 80 representatives from various volunteer involving organizations participated. The workshop opened up the discussion for the organizations to share their current volunteering situation and brainstormed for the solutions to better align their volunteer activities and volunteer engagement to the SDGs. In the Pacific, the International Volunteer Day started in Fiji with UNV Executive Olivier Adam making an official visit to meet with volunteers and development actors, UN agencies and local government. In Fiji, Olivier Adam also participated in the launch of the SWVR 2018 and the high-level panel discussion. The significance of the SWVR 2018 launch and the panel discussion in Fiji was that the key findings and perspectives of the global research – the importance of volunteerism in community resilience building - was reflected according to pressing issues and priorities in Fiji and the Pacific contexts. It also addressed critical support needed to volunteer and enabling environment creation to enhance potentials of volunteering and positive impacts. Following the visit to Fiji, the UNV Executive Coordinator Olivier Adam and the UNV Regional Manager for Aia and the Pacific Ms. Shalina Miah continued to Samoa. The International Volunteer Day celebration was held in Apia on 5 December 2018, with the Government officials, local and international volunteers, volunteer-based organizations as well as development partners and UN agencies. As part of the celebration, there was a tree planting event at Mount Vaea to plant 249 native trees required to sequester the greenhouse gases produced by their travel. The UN volunteers in Samoa partnered with the Ministry of Natural Resources and Environment and the Samoa Conservation Society to calculate the total amount of carbon emitted from their international flights to volunteer in Samoa. Throughout their lifetimes, the 249 trees will absorb more than 56 tons of CO2, making a major contribution to Samoa’s efforts to combat climate change. UN Volunteers have been serving in the Pacific since 1973, supporting government-led development efforts. In Samoa, national and international UN Volunteers work with youth employment programmes, in collaboration with the Chamber of Commerce, to assist young people develop the knowledge and skills needed to secure employment opportunities. In Cambodia, the 8th National Forum on Volunteerism and the International Volunteer Day 2018 celebration event was jointly organized by Ministry of Education, Youth and Sport (MoEYS) and United Nations Volunteers (UNV) in close partnership with civil society (represented by VolCam) and the private sector. These events took place on 5 December 2018 at Institute of Technology of Cambodia (ITC) in Phnom Penh and 20 more schools across the capital city. This was the 9th time where International Volunteer Day was celebrated in Cambodia jointly with the National Forum on Volunteerism. In Viet Nam, UN Volunteers gathered together and presented the 2018 State of the World's Volunteerism Report to more than 200 Vietnamese volunteers at Youth Forum organized by Youth Union, Vietnam Volunteer Center and Vietjet Air. The event was filled with joy and gratitude towards to work of volunteers across Vietnam, who are contributing to make their communities resilience. 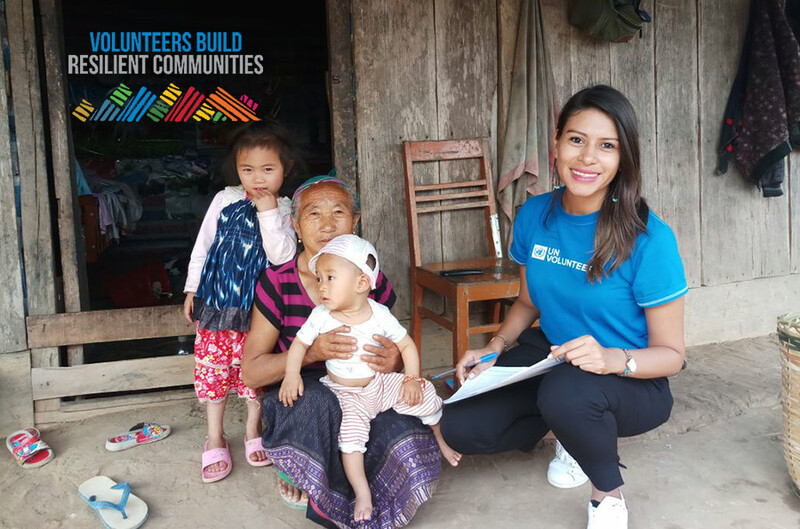 In Lao PDR, UNV recently collected volunteers’ stories on how they step up community resilience in Laos from various organizations that promote volunteerism. On the International Volunteer Day, they showcased their crucial efforts on building resilient communities to Lao government counterparts and delegates at the Development Exhibition at the 2018 Round Table Meeting. A huge variety of volunteer experiences from disaster relief and environmental conservation, to communications and education were shared on this special occasion, recognizing volunteers’ contributions to local development agenda. Moving to Nepal, several activities happened across the country. United Nations Nepal, VSO Nepal, Raleigh Nepal and Association of Youth Organizations Nepal (AYON) successfully conducted the Provincial level Dialogue at Sudir Paschim Province with more than 30 community volunteers coming together and having discussions on how they can make communities more resilient. Volunteers also donated blood and joined hands to clean their neighbourhood on the 5 December 2018. In India, UNV in India, PRAVAH, Restless Development India and Youth Collective organized the Youth Adda on Sustainable Development Goals (SDG) 11 – Sustainable Cities and Communities, as a part of the "Sustainable Development Goals and Us!". Youth Adda is an open space for young people to discuss tangible solutions to make SDGs a reality by 2030. Collectively they would make their leaders accountable for the promises they have committed to, for which the first step is to make sure all young people are fully aware of SDGs and understand their implications on our everyday lifestyle. It was started to develop an understanding about SDGs and their relevance among the youth and how they can take charge and contribute towards the same. Besides, V-Awards were presented to standout volunteers in India. V-Award is an initiative by the UN Volunteers India, aims to celebrate young people, who are making the world a better place for all, through their acts of volunteerism, every day and everywhere. On the International Volunteer Day, UNV and other partners recognize the efforts of Volunteers. More countries in the region – Afghanistan, Bangladesh, Bhutan, China, Indonesia, Iran, Myanmar, Pakistan, Sri Lanka, will also take part in this global celebrations, engaging volunteers from across the countries. Volunteers are helping to leave no one behind by reaching out to people, including those marginalized or difficult to reach, to bring people’s voices and knowledge into collective actions. This is crucial to build ownership of key issues that affect their communities. By coming together to volunteer, the sense of solidarity and connections among people working together are also strengthened. This is especially important for the most isolated and vulnerable communities where other types of support are limited.